Agile is not just a set of practices how to write a good software, but it’s more and more used in every part of the organization. 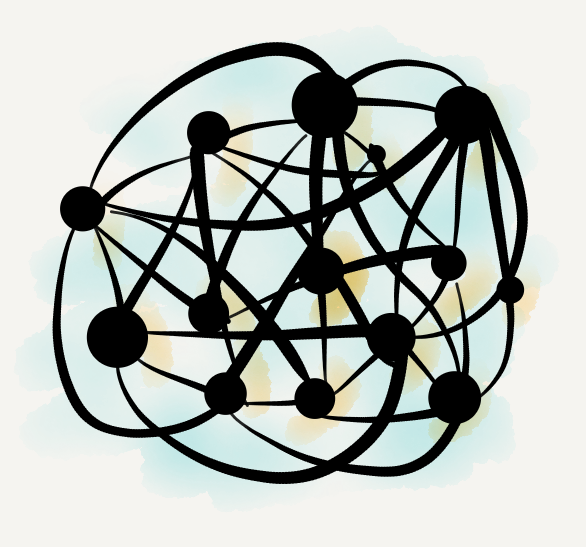 The traditional leadership (leader-follower model) is no longer acceptable in Agile environments. 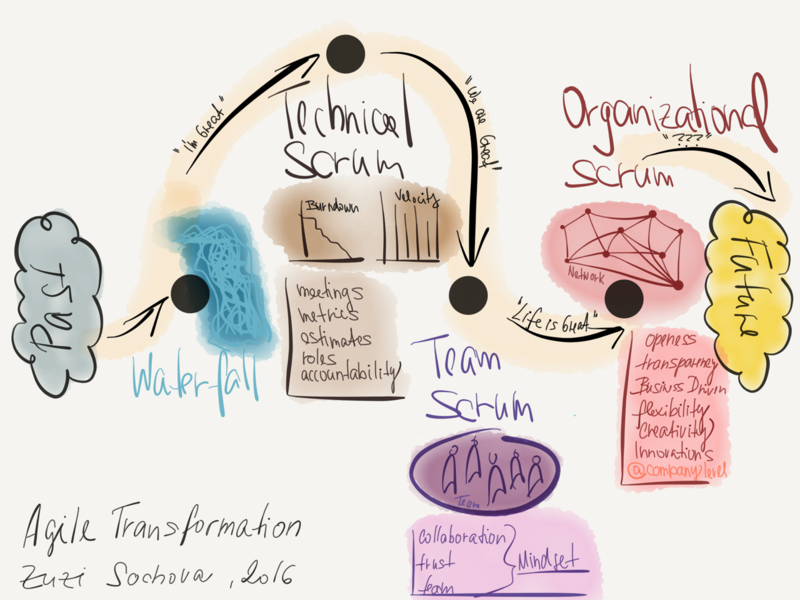 In the previous years, almost everybody focused on teams and how to adopt Agile, Scrum, and Kanban to the teams. But if we want to be successful at the organizational level, this is not enough. We need to push boundaries and help the whole organization to change. 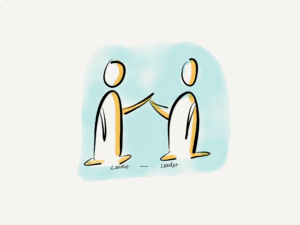 Hand in hand with that, we need to grow Agile leaders and support Agile leadership which is the critical key to the organizational success with Agile. As it was already mentioned, for real success, it’s important to change the whole organization into Agile. The common practice is to change IT department and leave it as isolated island inside the traditional organization. But this is just the beginning. The company has to follow the same culture and the same style of the working, so you hear more and more about Agile in HR and talent management, Agile finances, Agile marketing etc. 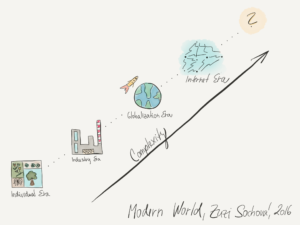 Finally, there is a term of Business Agility which brings back the real value of Agile. Agile was never meant to be development process of your IT. It was supposed to be business value driven. It should bring the startup mindset back to the organizations, and look at the delivery from a business perspective. Prioritize, deliver value in short cycles, get feedback, measure impact. 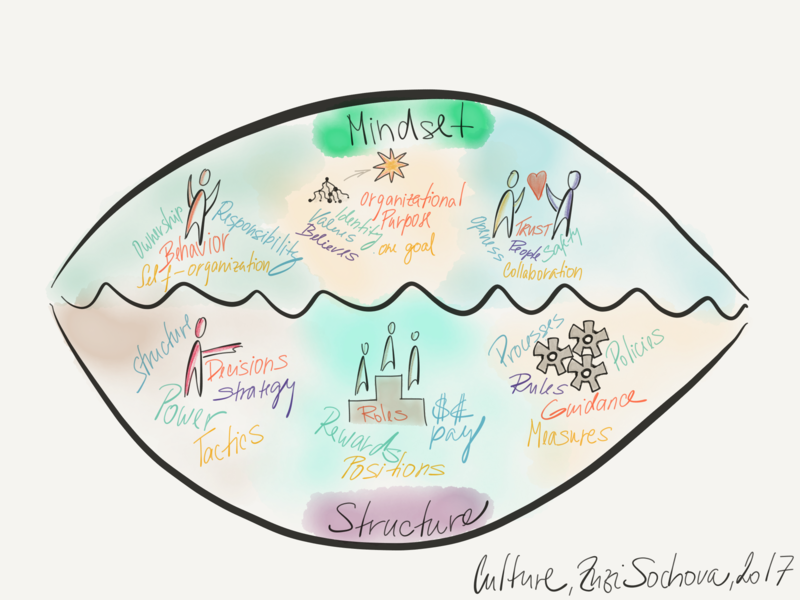 This is the real Agile mindset. 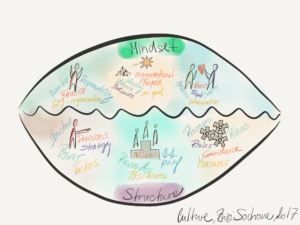 If you are in Agile or do you plan to try and implement it focus on these topics because without it Agile become only an empty skeleton of practices and processes. Agile is organizational change, it changes the mindset, culture, leadership, and business focus. If you take it as such change, you are going to be successful with Agile. The more the Agile Leadership is popular, people are asking for more description. Who is the Agile Leader, what makes him different from a traditional manager, and which competences and skills they have to have. So I created this Agile Leader Wheel so you can map the competences and skills. 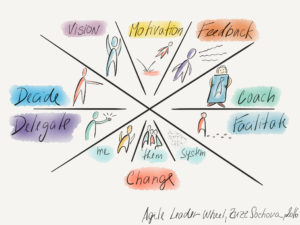 Great Agile Leaders have four core competences in which they can create vision, enhance motivation, get feedback, and implement change. Vision is the driving engine. It’s not necessarily related to the product and business but the organization itself. The second segment is motivation. 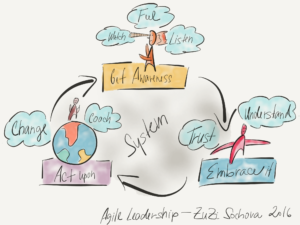 Agile Leaders understand the nature of motivation, are familiar with the power of intrinsic motivation of autonomy and purpose. The third one from the top section of Agile Leader Wheel is feedback. 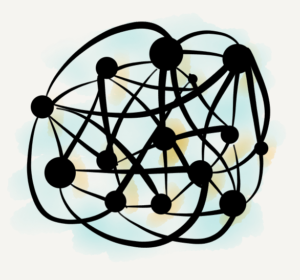 For Agile Organizations feedback is crucial, it makes the team and product feedback part of their DNA, it becomes integral part of their culture. 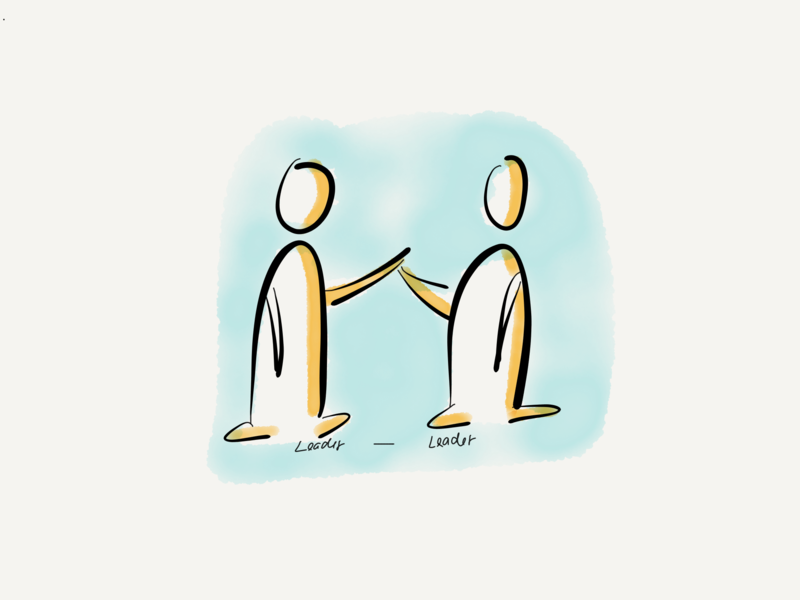 The same for Agile Leaders, the regular feedback from the system is the key to their success. The last piece is ability to implement change. For Agile Leaders the change is happening at three levels. Firstly there is change of myself, my own beliefs, reactions, the way I work. Secondly there is the ability to influence others. Make them part of my team, get supports who will help me to lead the change. 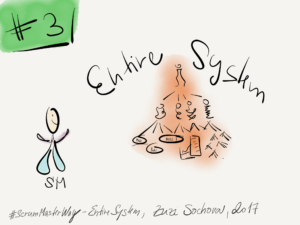 Finally the third element of change is change at the system level, the whole organization level. In addition to the mentioned competences, Agile leaders will need to balance the time when they need to take a decision and when it’s better to delegate and empower others to take decision and responsibility for that. 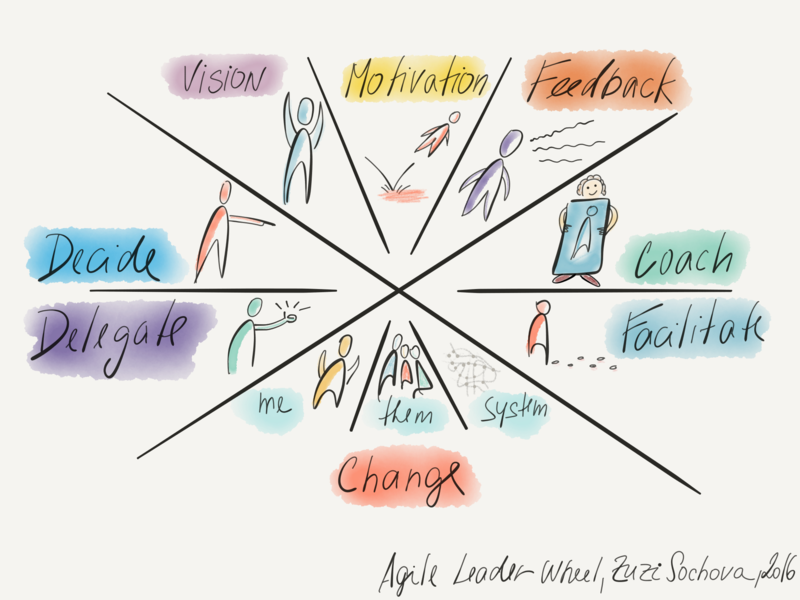 Finally on the right side Agile Leaders are facilitators and coaches. We are not speaking here about one-one coaching. Great Agile Leaders use coaching as a spice to address the complexity at the system level, and coach organization as whole. 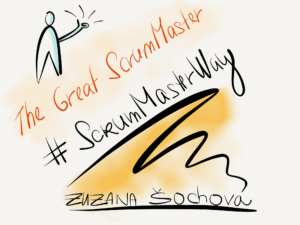 Great Agile Leaders are not born this way but constantly develop those competences and skills. 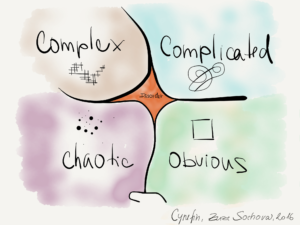 This concept is part of my Agile Leadership program where I help leaders to understand complexity of nowadays organizations and be successful in their roles. 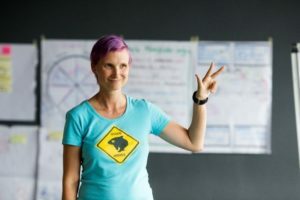 Looking forward to see you at some of my Agile Leadership workshops. Most of the people, when you ask them, admit that KPIs are not any useful at their organizations. They don’t motivate, they don’t change people’s behavior to any better way. In the best case KPIs are usually a formal metric, in the worst case a way how to punish people. In modern organizations, which are built on top of collaboration and teams, the need for individual metrics disappeared. So what can you do instead? If you have a bit of courage, you may try this: ask all team members to distribute for example 100$. They can give it to any team member, but can’t keep it for themselves. In a very short time, you get a very honest feedback. If you ask people to give Kudos or appreciations together with that, it’s awesome. Problem of bonus distribution solved. There are companies which distribute the bonuses not only within one team, but across the whole organization. To the receptionist, CEO, sales, developer. Your choice. We make it very transparent, so the system will correct any weird behavior as exchanging bonus money within two people. In general this is more theoretical question. I haven’t seen it happen but it comes out anytime we talk about it with managers. I guess it indicates lack of trust. Another way how to do it when your organization is more Agile is to give every month people some money to their bonus account, you can keep them of give some to the others. Each month the random person from your company rolls a dice and if there is a six, the money is yours and we start to build another jackpot. When it’s any other number, they just continue in moving money as appreciation. As no one knows when the money is going to be paid, they don’t game it. Finally, I have to admit that I don’t believe in any money bonuses. They are not going to help with real motivation and the risk of side effect is higher than possible outcome. So I would kill not only individual KPIs but bonuses as well. You can achieve better motivation by giving people autonomy, responsibility and clear purpose. And you can help them grow with coaching. It takes more time and energy then do KPIs and bonuses, but it brings higher results.